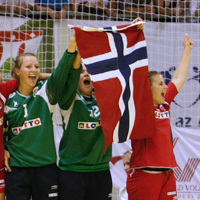 24.08.2009 - The Norwegians have beaten the hosts in the Final to claim their first ever title in this age category. 20.08.2009 - The ladies play for medals at the weekend in Hungary. 17.08.2009 - The best eight teams will fight for the trophy from Tuesday in Hungary. 11.08.2009 - The 3rd edition of the Women’s 19 European Championship will take place in Hungary.